Appearing at a 30th anniversary screening of Return of the Jedi, Mark Hamill commented on Disney's new Star Wars trilogy. The lives of Star Wars fans changed irrevocably last year when Disney purchased Lucasfilm and announced a slew of new developments for the franchise, including a new film trilogy slated to begin in 2015. Director J.J. Abrams has since signed on to the project as well as Academy Award winning writer Michael Arndt. Various reports have also said that cast members of the original trilogy would be returning to reprise their roles. While Disney has yet to officially announce the return of original series cast members, the actors, along with series creator-George Lucas, have done a pretty good job of it themselves. Most recently, Mark Hamill, appearing at a 30th anniversary screening of Return of the Jedi, commented on the new film and his role in it. "I don't even think I believed that the third trilogy would feature us. 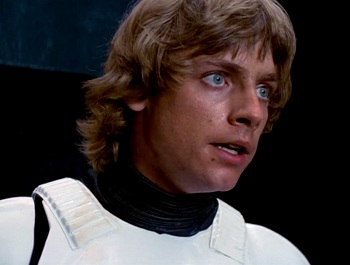 I thought it would be all different characters," said Hamill. "It wasn't even on the radar for me, at all. And I had sort of settled into my elderly recluse phase of my career." Hamill also discussed his hope to see the new films re-embrace some of the practical effects used to make the original trilogy. "I've only had one creative meeting about the new films, but I do remember saying, 'We've got to find a proper balance between CGI and old school [FX]." The three prequel films were frequently criticized for their heavy use of CGI, something Hamill wants to avoid. "I think there's nothing wrong with CGI, but I think you have to have a balance, because the camera perceives the width and the depth and the weight - even if it's a miniature model, the camera just realizes that."